RES-MPA correspondent Stratis Balaska has been under online and verbal attacks by members of neo-nazi movement “Golden Dawn” after publishing an editorial on August 15th. The publication covered history of Mytilene’s Chapel of Virgin Mary and its significance to the refugee women. Death threats, harassment and incitement to “punishment he deserves” were sent to journalists on Facebook. The threats online were a part of series of threats against Stratis Balaska because of his journalistic work. He was verbally attacked by three men, who he said to be extremists, on the street at the port of Mytilene, Lesbos, on August 12th. After that, Balaska was verbally attacked by another man when he was covering an erupted fire at the Tsamakia City Park. Stratis Balaska filed a complaint regarding the attacks to local police authorities. Three police officers and a military officer were arrested in relation to coordinated attacks against the journalist. In general, 15 persons have been listed for prosecution in relation to online attacks. European and International Federation of journalists support their Greek affiliates in condemning the coordinated intimidation and threats against journalists in Lesbos region, and ask the local authorities for a prompt investigation as well as to ensure the safe environment for the journalists to continue their work. There have been instances of violence against journalists and public activists by the “Golden Dawn” movement before. 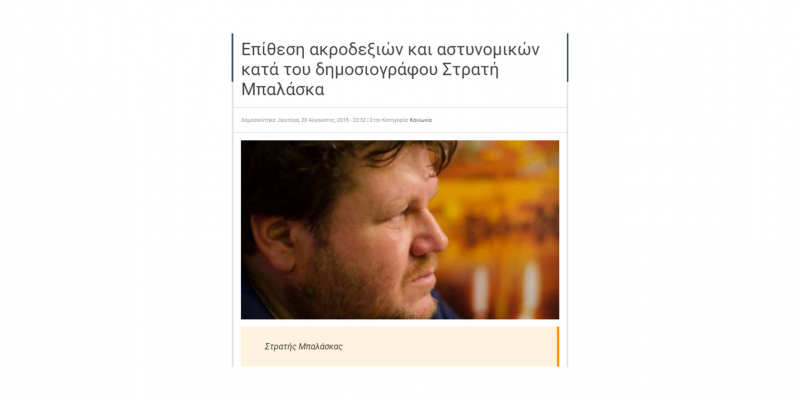 An alert was published on the Council of Europe platform for Protection of Journalists by EFJ-IFJ in 2016, after members of the movement violently attacked journalist Petros Anastassiades while covering a meeting on migration for Rizospastis newspaper at the Regional Council of Attica.